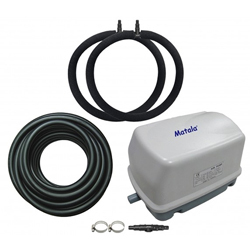 The Matala EZ Air Pro 3 Kit is designed for ponds between 5,000 to 16,000 gallons depending on your fish load. Air flow up to 70 lpm or 2.5 cfm. Maximum water depth 14 feet. Suggested water depth up to 7 feet. For Ponds between 5000 to 16,000 gallons. 2 x 8 inch diameter self weighted diffusers. 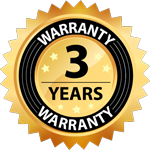 30 feet high quality 3/8" weighted hose.